Department of Pharmacognosy, Faculty of Pharmacy, K. V. M. College of Pharmacy, Kokkothamangalam, Cherthala, Alappuzha - 688527, Kerala, India. ABSTRACT: Holostemma ada kodien is one of the potential indigenous medicinal plants belonging to the family Asclepiadaceae distributed through the south Indian region. Traditionally, it is used for a laxative, ulcer treatment, blood purifier, itching, leucoderma, gonorrhea. The most important medicinal uses of the plant are Antipyretic, antioxidant, anti-diabetics, hepatoprotective. The objective of this study was to evaluate the anthelmintic activity of macerated ethanolic extracts of roots. Preliminary phytochemical investigation show the presence of Alkaloids, phenols, saponins, tannins, flavonoids, steroids, anthocyanins. The data revealed that the ethanolic extract showed anthelmintic activity at concentration 50 mg/ml. 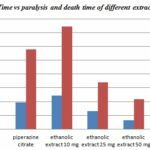 The paralysis time and death time of ethanolic extract was found to be less than that of standard drug. Allopathic drugs have serious side effect development of resistance; the herbal remedies can be a superior alternative for helminthiasis. INTRODUCTION: Healing with medicinal plants is as old mankind itself. The connection between man and his search for drugs in nature dates from the far past, of which there is ample evidence from various sources: written documents, preserved monuments, and even original plant medicines itself 1. Helminthic infections are among the most common infections in human beings, affecting a large proportion of the world’s population 2. The drugs that destroy or prevent the growth of parasites such as hookworms, pinworms, tapeworms, filariae, etc. are known as anthelminthic drugs. An anthelminthic drug acts on the parasites and alters their carbohydrate metabolism, inhibit neuromuscular action, decrease the respiratory enzymes 3. To overcome these problems, alternative strategies had been put forward against the intestinal nematodes which are the screening of medicinal plants to produce the activity against the helminths. To overcome the resistance problem and the side effects caused by synthetic drugs, we can develop the anthelminthic drugs from the plants by using the screening technique. The screening technique is very effective, sensitive, and cheap and can also be reproducible. The bioactive plants have secondary metabolites which act directly or indirectly on the parasites and reduce the growth in the intestines of human beings. Traditionally, Holostemma ada kodien is used for the treatment of laxative, ulcer, itching, leucoderma, gonhorrea. Roots and leaves are used in the form of powder and juice to treat spider poisoning. The most important medicinal uses of the plant are antipyretic, antioxidant, antidiabetic, hepatoprotective, and antibacterial 4. Other uses include rejuvenating, aphrodisiac, expectorant, galactagogue, stimulant, ophthalmic disorders 5. The main aim of the study was to evaluate the anthelmintic activity of macerated ethanolic extract of roots of Holostemma ada kodien on Pheritima Posthuma. Plant Materials: The roots of Holostemma ada kodien were collected from pulikkal local area of malappuram district, Kerala state in January 2018 and authenticated by A. K. Pradeep Asst. Professor, Department of Botany, University of Calicut. Preparation of Plant Extract: The roots were washed thoroughly with tap water to remove soil and foreign materials, and it was dried under sunlight for an hour and shade dried completely. The dried roots were then pulverized into coarse powder. The extraction was done by maceration method in ethanol for 72 h with random shaking. The extract was filtered, and the filtrate was concentrated by using vacuum evaporator to remove the solvent completely. The dried extract was stored in a refrigerator for further use 6. Phytochemical Analysis: Preliminary phytochemical analysis was carried out on the macerated ethanolic roots extracts using standard procedure to identify the constituents present by characteristics color changes 7, 8. Selection of Worms: The anthelmintic activity was performed on earthworm Pheretima Posthuma have been widely used. Because of their easily availability, anatomical and physiological resemblance with the intestinal worm parasite of human beings. Adult earthworm Pheretima Posthuma were collected from a local supplier. Anthelmintic Activity: Ethanolic extracts of Holostemma ada kodien roots were evaluated anthelmintic activity against Pheretima Posthuma. Five groups were selected; each group containing six earthworms approximately of equal size was used to study. Each group of earthworms was tested with different concentration of plant extracts (10, 25, 50 mg/ml), distilled water was used as a control, and piperazine citrate (10 mg/ml in distilled water) was used as reference standard. All these dilutions were poured into the Petri dishes accordingly. Earthworms, nearly equal sizes were placed in each Petri dish at room temperature. Time for paralysis was noted down when no movement of any sort could be observed, except when the worms were shaken vigorously. Time of death for worms was recorded after ascertaining that the worms neither moved when shaken vigorously nor when dipped in warm water (50 °C). The death was confirmed when worms lost their motility followed the fading color of the worms. The paralysis time and death time were recorded regarding seconds/minutes 9, 10, 11. RESULTS: Preliminary phytochemical analysis of macerated ethanolic roots extracts of Holostema ada kodien revealed the presence of some secondary metabolites Table 1. Ethanolic extracts of Holostemma ada kodien roots shows anthelmintic activity against Pheretima posthuma. The Ethanolic extract at dose 50 mg/ml caused paralysis in 6 min and death in 21 min and the time took was less compared to paralysis time and death time of reference standard Piperazine citrate (10 mg/ml) respected to sec or min. Show Table 2 and graphical representation Fig. 1. DISCUSSION: Preliminary phytochemical analysis of ethanolic extract showed the presence of tannins, alkaloids, steroids, terpenoids, and phenol. Phenol interferes with energy generation with the tannins and binds to the proteins. Alkaloids interfere with the CNS and cause paralysis and death and interfere with hemostasis. Piperazine citrate increase chloride ion conductance of worm muscle membrane produce hyperpolarization and reduce excitability that leads to muscle relaxation and paralysis. Ethanolic extracts of Holostemma ada kodien roots exhibits anthelmintic activity dose-dependent manner. 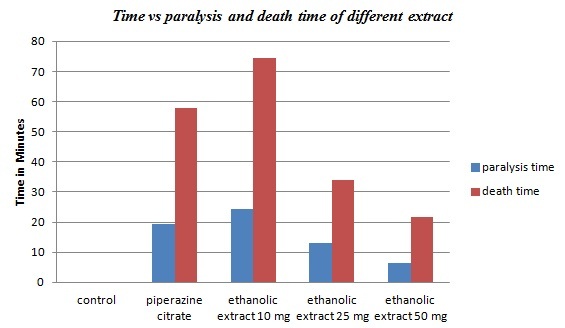 Ethanolic extract of the plant not only show the paralysis but also caused death in a short time as compared to reference drug Piperazine citrate. CONCLUSION: The result of the present study clearly indicated that the crude ethanolic extract of dried roots of Holostemma ada kodien belongs to the family Apocynaceae produce anthelminthic activity against Indian Earthworm, Pheretima Posthuma. The drug process significant anthelminthic activity at 50 mg/ml, concerned measured by the time taken for paralysis of the death of the Earthworm. The current studies lead to the conclusion that the root of Holestemma ada kodien has potent anthelminthic activity. But compared with the conventionally used drug it has less effect. Further studies using in-vivo models and to isolated active constituent from the extract are required to carry out and establish the effectiveness and pharmacological rationale for the use of the drug as anthelminthic drug. Hassan BAR: Medicinal Plants (Importance and Uses). Pharmaceutica Analytica Acta 2012; 3: 139. Mali RG and Mehta AM: A review on Anthelmintic plants. Natural Product Reliance 2008; 7(5): 466-475. Narasimha Rao R, Bhavya B, Pavani K, Swapna A, and Prasoona CH: In-vitro Anthelmintic activity of Symplocos racemosa. International Journal of Pharmacy and Biological Sciences 2011; 1(3): 198-230. Junapudi S, Janapati YK and Bramha PV: A review on medicinal plants of Holostemma ada-kodien 2016; 5(3): 276-278. Solanki R and Nagori BP: New Method for extracting phytoconstituents from plants. International Journal of Biomedical and Advance Research 2010; 03(10): 770-774. Srujana TS, Babu KR and Rao BSS: Phytochemical investigation and biological activity of leaves extract of plant Boswellia serrata. The Pharma Innovation 2012; 1(5): 1-25. Nazneen F, Muddassir M, Meshram K, Umekar MJ and Lohiya RT: Phytochemical screening and comparative anthelmintic activity of alcoholic extracts of some herbal plants. Journal of Pharmaceutical Sciences and Research 2017; 9(7): 1240-1242. Vanilla V and Nivetha R: Screening the in-vitro Anthelmintic activity of Alteranthera sessilis World Journal of Pharmacy and Pharmaceutical Sciences 2015; 4: 1402-1415. Vidyadhar S, Saidul M, Gopal TK, Chummundeswari D, Rao U and Banji D: In-vitro anthelmintic activity of the whole plants of encostemma littorale by using various extracts. International Journal of Applied Biology and Pharmaceutical Technology 2010; 1(3): 1119-1125. Ghosh T, Maity TK, Bos A and Dash GK: Anthelmintic activity of Bacopa monierri. International Journal of Natural Products 2005; 21(2): 16-19. Anu V and Pavithra P: In-vitro anthelmintic activity of macerated ethanolic extracts of roots of Holestemma ada kodien. Int J Pharmacognosy 2019; 6(1): 30-32. doi link: http://dx.doi.org/10.13040/IJPSR.0975-8232.IJP.6(1).30-32.